Welcome to the Monkey Bar!!! Great Food, Best Pizza in Town!!!!! 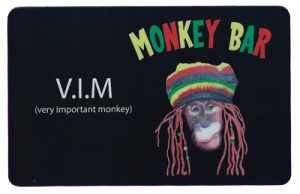 Get your Monkey Bar V.I.M. Card today! Join our Very Important Monkey club!!!!! Enjoy great savings and extra benefits! Just ask any of our friendly staff!!!! !